The party has been accused of backtracking on an election pledge before we’ve even voted. FINE GAEL HAS been accused of ‘backtracking’ on one of its key election promises to abolish the USC after comments from Finance Minister Michael Noonan this morning. 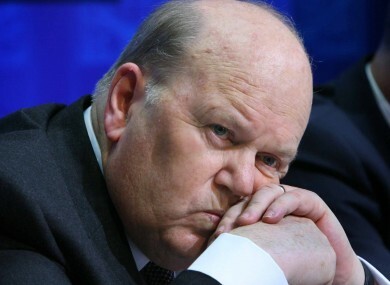 Noonan has confirmed that higher earners will be hit with new levies to “clawback” some of the benefits of the abolition of the Universal Social Charge which his party has committed to doing if re-elected. Answering questions in the Dáil this morning, Noonan confirmed his party’s intention to phase out the unpopular tax over five years at a cost of nearly €4 billion a year. It is my intention, should I be given the opportunity to present further Budgets, to clawback some of the benefits of the USC abolition for the highest earners. Noonan pointed to the fact that the income tax and USC cuts announced in this government’s last two Budget have been capped so that the benefits of this reduction stop for people on €70,000 and over. The Limerick TD said he would be setting out the details of Fine Gael’s position “in due course”. But Sinn Féin’s junior finance spokesperson Peadar Tóibín said that Noonan’s remarks are “a far cry” from Taoiseach Enda Kenny’s pledge to abolish the charge. “Previously the Fine Gael approach has been to backtrack on their elections promises, while in government,” he said. This appears to be a first in that they have backtracked on their main election promise before the election has even been called. Email “Fine Gael's promise to scrap the USC is not all it seems ”. Feedback on “Fine Gael's promise to scrap the USC is not all it seems ”.